Over the past 30 years, the technocrats in Beijing have attained an almost mythical status. The decade after two decades of rapid double-digit growth has transformed China into the world’s second-biggest economy, slashing poverty at the same time. Deng Xiaoping transformed China from a poor, centrally planned, rural economy into the vibrant, export-oriented juggernaut that remains one of the world’s fastest-growing major economies. But those golden days are now over. Beijing wanted to re-balance the Chinese economy, to make growth less focused on exports and more reliant on consumer spending. It wanted slower but more sustainable growth that gradually took the heat out of overvalued property and consumer prices. China’s economy is now being targeted by the Politburo for +6.5% growth. The ruling Communist Party has tried to utilize China’s stock markets as a tool to help make the state-dominated economy more efficient. A strong equities market is useful for raising capital in what is likely to be a lengthy deleveraging exercise for the economy. Private capital is also helpful in taking the burden of funding investment projects away from state-owned banks. The Politburo wants a strong stock market to enable state companies to raise money and pay down heavy debt loads and become profit-oriented and competitive. Communist planners also hoped investing would help families save for retirement, easing the pressure on Beijing to pay for pensions and healthcare. Taken together, China’s stock markets now rank second in the world in market capitalization behind the New York Stock Exchange, and Nasdaq. 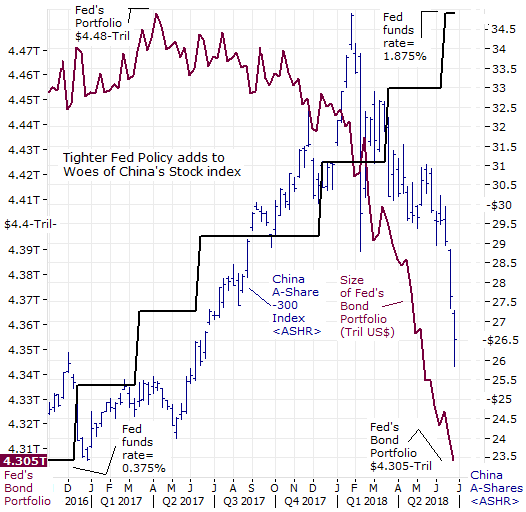 Despite their size, China’s markets trade like the wildest emerging markets with huge volatility, big boom and bust cycles driven by fast-trading individual investors and heavy involvement from the government. China’s stock markets are dominated by small individual investors, who held more than 80 percent of shares. There are between 70 and 80 million trading accounts operating in Chinese markets. small investors ultimately control the trading. Trading volume on the Chinese market is four times bigger than on the NYSE, with 3% of the market by value turning over every day. On the NYSE, that number is 0.3%. It is estimated that 17% of the Chinese market is financed by margin lending, where shares are used as collateral for loans, subject to repayment in the event of a fall in their price. So a boom in stock prices could unwind even faster if sentiment sours. If the stock market collapses, the market could produce a political backlash against the Xi leadership. Yet the Chinese stock market doesn’t have much connection with the real economy, which has been moving to an entirely different rhythm for years. Instead, share prices tend to rise and fall on sentiment and government actions, rather than economic fundamentals, and despite all of the drama they create by trading shares, a relatively small proportion of China’s vast population actually invests in the market. The Shanghai Composite Index more than doubled between late 2014 and June 2015, then lost half of its market value over the next seven months. Beijing desperately tried to halt the meltdown by throwing 1.5-trillion yuan at the “problem.” Chinese authorities also started arresting people. First short-sellers, then brokers, then journalists, and finally, just plain old sellers. Beijing effectively transformed China Securities Finance Corp <CSF>, the state-owned margin lender, and Central Huijin Investment, a subsidiary of China’s sovereign wealth fund, into a giant, state-run, margin lending, prop desk. “China’s “National Team” bought 7% of the mainland stock market as a result of the massive state-sponsored rescue effort to prop up share prices following the market crash. Every time National Team attempted to step out of the market, chaos ensued. Last week, in an eerie sense of deja vu of the 2015 boom and bust experience, Chinese investors dumped Red-chip and small-cap stocks across the board as US President Donald Trump threatened to slap tariffs on as much as $450-billion of China’s exports to the US, knocking the Shanghai benchmark to a near two-year low despite government efforts to calm the panic. The slump risks triggering fresh margin calls in a highly-leveraged stock market, potentially causing a downward spiral that could derail Beijing’s plan to lure the listings of high-tech giants. The Shanghai Red-chip Index closed below the psychologically key 3,000-point level. Small-caps, with the start-up board, ChiNext and Shenzhen’s SME board were hit harder. The ChiNext ETF (NYSE: CNXT) tracks 100 of the largest and most liquid stocks trading on the Small and Medium Enterprise (SME) Board on the Shenzen Stock Exchange. In 2018; Emerging currencies and stock markets are plummeting under the strain of higher US interest rates and the Emerging nations are getting very little sympathy from the Federal Reserve. Central bankers in India, Turkey, Mexico, and Indonesia have been forced to raise interest rates and urged the Fed to move with more caution with its Quantitative Tightening <QT> scheme. However, there are few signs such concerns will steer the Fed away from its course for at least two more rate increases this year, and its plan to drain -$40-billion per month in Q’3 from the world’s money markets, and -$50-billion per month in Q’4, thru QT. The Shanghai Composite has tumbled into its fourth Bear market in the past 3-years, and the recent decline comes at a very precarious time for China whose economy is slowing amid an aggressive deleveraging campaign, corporate defaults are rising, and the all-important credit impulse is waning. Overall, Chinese stocks have lost $1.6-trillion in total value – more than the size of Canada’s entire economy – since a high in January, threatening to dethrone China as Asia’s largest capital market in the process. The Shanghai Red-chip Index has fallen by -22% from its January peak. A loss of another -6% in market cap will cede the title of the region’s biggest stock market to Japan. Fueling last week’s decline was a leaked report from a Chinese government-backed think tank which warned of a potential “financial panic” in the world’s second-largest economy, “a sign that some members of the nation’s policy elite are growing concerned as market turbulence and trade tensions increase.” The think tank also warned that leveraged purchases of shares – i.e. stocks bought with margin loans – have reached levels last seen in 2015, when a market crash erased $5-trillion of value, a major contributor to the market collapse three years ago. Such bet reached about 5-trillion yuan ($760 -billion), a similar level to 2015, according to the think tank report. China’s yuan dropped for ten straight days, extending its longest losing streak in four years, because of expectations that the People’s Bank of China (PBoC) was shifting to a policy allowing the Chinese currency to depreciate amid an escalation of China-US trade tensions. The yuan started to fall on June 14, after the Chinese central bank decided not to follow US interest rate increases on the day, The PBoC cut the reserve requirement ratio, the share of deposits lenders must put aside with the central lender, for commercial banks by half a percentage point from July 5. The cut would free up 500 billion yuan (US$77-billion) in funds for the big banks, including Industrial and Commercial Bank of China and China Construction Bank, to finance debt-to-equity swaps, a measure often used for troubled state enterprises. It would also free up 200 billion yuan for smaller banks to boost lending to small businesses across the country. The combined 700 -billion yuan liquidity injection exceeded market expectations of 400 -billion yuan. In the PBoC’s last targeted RRR cut in April, 400 -billion yuan of net liquidity was released.